I love halva but have never made it myself – yours looks delicious! you photos are brilliant too! A great day out. Wish the sun would come out here. Adding the white chocolate must have made them even more fudgy – they look good! Sweet treats and a Cornish beach – the sort of combination to dream about. Lovely stuff. Delicious sounding variation on normal flapjacks. I’m sure they were perfect to eat on the beach. What a wonderful picnic spot! Your flapjacks look better-cooked than mine. I think I should have left them in for longer. Jac – hope it came out for you. We haven’t seen the sun here in quite a while. Suelle – fudgy is the best way of describing these flapjacks. Not like flapjacks at all really. Malli – thank you for your kind comments and for following my blog. Phil – I know, I’m very lucky living here. Mimi – Thank you, but I bet you don’t miss all our wind, rain and grey skies really! Corina – Dan is a very creative man. Foodycat – mine were still very fudgy on the inside. If flapjacks are what you are after, I think we need to come up with another name for these. Sounds like a wonderful day, Choc! Really have to try flapjacks, I’ve been saying that ever since I saw them on Suelle’s blog! Your rolls look yummy too, what did you fill them with? have seen these flapjacks around the blogs and I have wanted them very much – what a great idea! The views of the beach look fabulous. I have to admit I haven’t come across Halva Flapjacks before but they look lovely. This must have been a wonderful day. The scenery is beautiful and the halva looks interesting and delicious. I hope you have a great day. Blessings…Mary. I love halva… simply love it… I am going out to buy these ingredients today… bloody great, plus I love your photo’s… nice feet! Chele – ha ha, fun indeed. The temptation is always to plaster my posts with photographs of local flora and views but have to keep reminding myself this is a food blog! 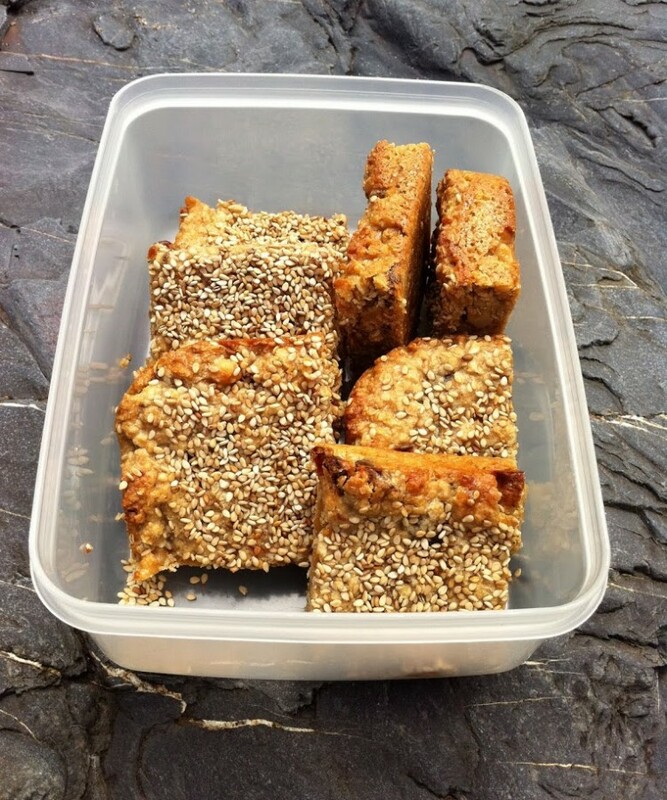 Celia – flapjacks are wonderful things and always very portable. Rolls I just filled with cheese, chutney (mine of course) and lettuce – nothing too exciting, but very tasty. CC – Dan’s full of great ideas. Johanna – one word of warning, they are very sweet. Maggie – thank you, this is a new one for most of us I think. Mary – thank you, it was a lovely day. Dom – ha ha, those feet are becoming quite popular. These halva flapjacks look amazing, perfect for snacks, or in the morning. Thanks Tina. They were delicious and it’s about time I made them again. Maybe I am the one and only person here who is not fond of tahini ? Whenever I used to buy a jar it always remained in the cupboard for a very, very long time, eventhough I tried things like tahini-cookies and baba ganush. So I am not going to buy another one. Do you think the recipe will work with peanutbutter (in fact I always have an organic nutbutter with (mainly) peanuts, hazelnuts, almonds and cashewnuts) ? I’m sure it would work Henk. Peanut butter flapjacks are on my extremely long list of things to try. Of the 4 flapjack-recipes I have tried so far, all from your website, for me this is really the best till now, and even worth buying a new tin of condensed milk for ! Best taste and best consistency, even though the chocolate ones come close. Because I didn’t want to do any shopping I had to make some alterations. So, the tahini was substituted by the organic nutbutter as described above. The walnuts were replaced by a mixture of pecannuts and slivered almonds (lightly roasted in the oven to enhance their flavours). Of course it is different from tahini, but it sure works. Henk, you are going to be the flapjack expert if you keep this up. I’m going to follow your lead and try it with a nut butter next time. I bought a new tin of condensed milk last week and baked these flapjacks today for the 2nd time, using 75 gr of white chocolate (standard bar size here) and organic peanutbutter instead of tahini. So delicious ! You should be awarded for this recipe ! I am thinking of substituting the white chocolate for dark chocolate next time, just out of curiosity. It should be good as well. Made the dark chocolate version this morning. As we both expected, it works out well indeed ! Alterations: 85 g of ‘ordinary’ dark chocolate instead of white chocolate, peanutbutter instead of tahini, 250 g oats instead of 225 g. To loosen up the stiff dough a bit, as well as for extra flavour, I added 30 g of Hungarian walnut liqueur. The taste of the peanutbutter is less prominent in this flapjack, but the result is anyhow very satisfying.